Dr Shelby Temple, from the University of Bristol’s School of Biological Sciences, has been named Innovator of the Year 2017 for his ground-breaking work into polarisation and macular degeneration. 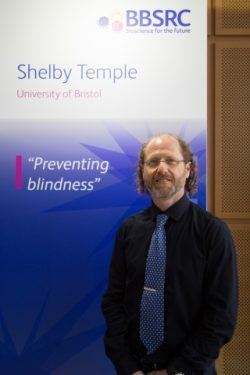 The Biotechnology and Biological Sciences Research Council (BBSRC) award recognises Dr Temple’s work in developing a device that can rapidly screen people at increased risk of age-related macular degeneration (AMD), the worldwide leading cause of incurable blindness in people over 55. The innovation arose from BBSRC-funded research carried out at the University of Bristol, which looked at the ability of octopuses, cuttlefish and coral reef fish to see polarised light – an aspect of light that humans aren’t typically aware they can see. Dr Temple invented a series of unique devices to display polarised light to animals, and in doing so, realised he could see a pattern as well. “What I was seeing was an effect known as Haidinger’s brushes, which happens within the eye when people perceive polarised light. The ability to see this phenomenon is linked to an aspect of eye health and can be an early indicator of disease. “It became clear that the tools I had developed for octopuses and cuttlefish could be the foundation for a novel ophthalmic device that could rapidly screen people for susceptibility to AMD,” said Dr Temple. This award acknowledges the important impact this device could have in preventing sight-loss worldwide. In the UK alone, AMD affects more than 600,000 people and is estimated to cost the healthcare system £1.6 billion annually. As well as being named Innovator of the Year 2017, Dr Temple also received the award in the Commercial Impact category. In December 2015, Dr Temple took part in SETsquared’s ICURe Innovation to Commercialisation Programme, which offers university researchers with commercially promising ideas up to £50k to ‘get out of the lab’ and validate their ideas in the marketplace. Following on from this, in 2016 Dr Temple received £500,000 in funding from Innovate UK, which launched Azul Optics Ltd, the Bristol-based start-up that is commercialising the device. Azul Optics has since secured an additional £310,000 in private investment.